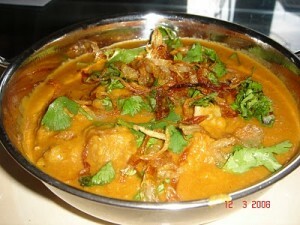 Chana Dal Gosht recipe by Nazia at DesiRecipes.com. Chana Dal Gosht is a dish in which roasted meat is cooked with gram lentils, using spices in small quantities. Wash dal in few changes of water until water run clear then leave to soak in cold water for about one hour. Drain dal and keep aside. Add dal , salt and chili powder. Mix well and pour enough water to cover dal by one inch. Cover with tight fitted lid, reduce heat. Cook for 30 minutes or dal is tender and about one cup of water is left. Add garam masala, coriander leaves and green chilies. Serve with Nan, Roti or plain boiled rice.